Starbucks may be best known for their coffee, but the chain's seasonal offerings also make waves. In spring and summer, Starbucks offers dozens of iced specialties, including unique Frappuccinos and cold foam tea lemonades. In the fall, Starbucks fans go crazy for the PSL, or pumpkin spice latte, and winter is no different. The peppermint mocha and gingerbread latte are perennial favorites. But their holiday beverages are just one part of the equation. 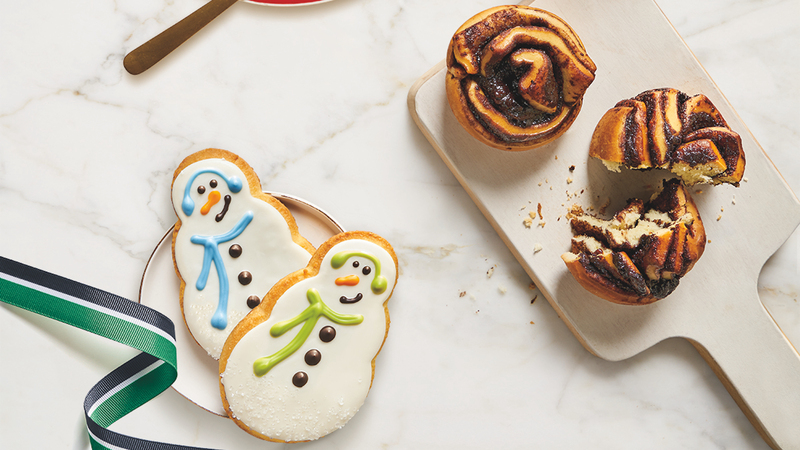 Each year, Starbucks offers several seasonal food specialties. This year, Starbucks will be offering three new seasonal bites. So, what's on the menu? Brioche is a type of bread known for its rich flavor, and Starbucks' latest item is a decadent pastry layered with a dark fudgy chocolate filling. If you love pistachios — and the buttery, flakey flavor of a croissant — then you're in luck; the pistachio-honey croissant pairs perfectly with coffee or as a stand-alone snack. According to Starbucks, this delicious-sounding Danish is "croissant dough topped with [a] creamy cheese filling and plum spread." Yum! Starbucks will also be welcoming back several fan favorites, including the gingerbread loaf, penguin cake pops, peppermint brownie cake pops, snowman cookies, Cranberry Bliss bars, carved ham and Swiss breakfast sandwiches and their beloved holiday turkey panini, which is a delicious warm sandwich with turkey breast, turkey gravy and cranberry-herb stuffing served on ciabatta bread. That said, be sure to grab these goodies soon. They will only be available for a limited time.